Now, you have to brainstorm ideas related to the essay topic you have chosen previously. When you are brainstorming ideas, there is only one rule to adhere: no idea is ruled out during the period of the brainstorming. As with brainstorming, do not reject anything at this stage. Grammar or spelling is not important during brainstorming. Do not waste your time correcting grammar or spelling errors. This method is simple and effective. All you need to do is to create a list of words and short sentences related to the essay topic chosen. You can choose from a variety of mind maps to draw. 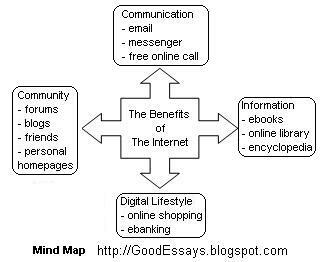 Then, you should write the points on the mind map. Do not waste your time drawing a complex mind map! A simple mind map will look like this. Using mind map, all your points are grouped together neatly for easy reference. Mind map is highly recommended for reflective essays and factual essays. Ask yourself as much as possible Wh-questions related to the essay topic chosen. This writing method is suitable for descriptive essays, narrative essays and reports. What is the brand of the hit-and-run car? Answers to these questions are the points for your essay. After you have finished brainstorming ideas, you can proceed to the next step: Organize and Outline Your Essay. those articles, as all of them make sense and are very useful. Thanks so much for sharing. I can be very good reader&listener if you are same searching for all to be good. Appreciate for your time!